When Kristina and Glen came in to the studio for the first time, we knew right away they were going to be fun to work with. Kristina from Russia and Glen from Australia are married and began working out together this past summer. Glen suffers from injuries in both his knees and shoulders which for some can be very frustrating resulting in loss of motivation due to limitations. But for Glen, he embraces it. He has learned new ways to work his body to strengthen the areas where he hasn’t been able to for years. In their private duet sessions, Kristina works to keep him motivated by giving him some competition. Friendly, of course! Kristina also joins Xtend Barre classes a few times a week while Glen is on his own in a Reformer class. When they can, they also join the Mat Pilates class, where Glen feels even more competition on the mat! UM: Why did you decide to begin a workout routine together, instead of individually? Both: Because we are both lazy! Really we chose to do it together for a number of reasons. We wanted to find a form of exercise that we could both do together as a couple and that we both wanted to try and would enjoy. After some serious, and not so serious suggestions (guess who made those) we agreed that we both wanted to try Pilates. And secondly, everyone has their days where they don’t feel like going to class, however to tell you partner you don’t want to do it makes that much more difficult to skip class so its a great motivation. UM: Do you ever sense a bit of competition during your sessions or in class? Glen: Being from a sports background I’m competitive in everything I do and I don’t like to lose. So when Kristina can do leg circles without blinking or breaking a sweat and I hit the wall after 3, then I can get frustrated. However I have learnt to utilise this in a good way and channel it into pushing myself a little harder each time we do a class to improve myself. Kristina: I don’t really feel any competition with Glen, however I do find his competitive nature quite funny. What I have noticed is that when he does achieve something that he was struggling with and is happy with his achievement, I also share the happiness, which encourages me more. We do however always manage to have a laugh with each other over things like this which just makes it enjoyable. UM: What is your favourite class or workout at the studio? 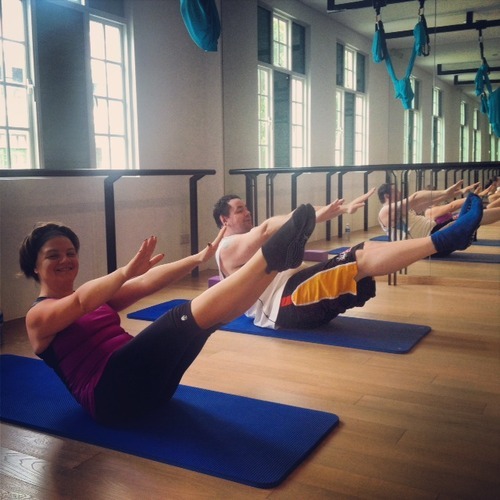 Glen: I’m doing Private Pilates lessons, Reformer Essentials and Group Mat Pilates classes. I really can’t pick between them as I get different things out of each class that are important to me. I do love using the Reformer though, and not because of what Kristina thinks, “you like to exercise lying down”, but because it's different to exercise using a machine like that and it allows me to do exercises I normally couldn’t do standing up, due to my injuries. Kristina: I’m doing Xtend Barre, Group Mat Pilates and Private Pilates. I agree with Glen in that each class offers different challenges, which I enjoy, so I really don’t have any one favourite workout or class. The thing I do like about having a private class each week is that a private class does allow you to focus on certain areas or exercises you want to work on as well as work closer with the instructor on an exercise you are struggling with. UM: What keeps you motivated? Glen: The biggest motivation for me is being able to work out together. It’s one of our "couple time" things we do. Also, as I do more and more classes and I see and feel the benefits, the motivation to maintain what I have achieved and to continue to improve, has become stronger. Kristina: My motivation is about building self confidence, mainly about the way I look and how I feel about myself. Finishing a class gives me a great sense of achievement and I turn this into motivation to do the next class. UM: What do you most look forward to in class/sessions? Least forward to? Glen: Thats actually a hard question and I don’t think there is any one thing in particular thing that I look forward to the most; it’s all important to me. What I do like is that feeling when I get home that I have done a class and I can feel good about myself. What I look forward to the lease, is when any exercise that begins with the instructor saying “now lets try this, it’s a lot of fun” you know full well you are about to head into a world of pain! Actually to begin with, because of the amount of injuries I still have from sport, I was always afraid of not being able to do a lot of the exercises. however, in working with the instructors and finding variations I can do, this is becoming something I don't worry about any more. Kristina: Well my favourite and least favourite is actually the same thing, the pain! I look forward to it because it means I have pushed myself to exercise when it would be much nicer sitting on the couch watching TV, so it’s a reminder of achieving something. But it’s also the least favourite because IT HURTS! That said I also enjoy doing a class with Glen and it makes me proud we are doing it together. UM: Describe the changes you are feeling and seeing in your bodies, and minds! Glen: A very quick change I noticed was a change in my posture when walking and sitting. I’m sure this paid a huge part in my previous issues with back pains, vanishing. Also in conjunction with changing my diet I’ve not only had weight loss but also developed muscle definition i hadn’t seen since my sports days. All this has contributed to the biggest change I have noticed, and that is mentally. I have previously tried many different exercises and diet programs on my own with no effect. This time it’s different. I have seen fast changes in my body, reduced pain, and this has put me in a much more positive mind fame. I have now even increased the number of classes I attend each week. Kristina: I have never been a sporty type and have not exercised since my high school days, but this said, I always wanted to have a nice toned figure so I have also tried many dieting programs but these only ever worked for a short time. Also quite obviously is that you don’t build muscle definition from dieting either. So I have noticed since doing all my classes that my body has begun to change shape and that I am developing some muscle definition and that makes me feel so good. UM: What are some of your goals, and have you met any of them yet? Do you set goals for every few months, etc? Glen: I didn’t have any real goals beyond getting fit and losing some weight. I don’t actually like to set hard target goals in case I don’t reach them, which I would see as a failure. I’m competitive remember? Instead, I just focus on making an improvement each week in class whether it’s doing 1 extra leg circle or holding a certain position for 1 second longer. This shows me I'm improving and I know that means the benifits will follow. Kristina: I’m sort of the same. I don’t have any specific goals that I set myself. Instead, they are more general in nature like make sure I go to classes each week, continue to eat healthy, etc and in doing this the rest will follow. As long as I can feel good about myself and what I have achieved each week then I know I’m doing well. UM: How will you keep to your workouts when you are on holiday? Glen: ummmmm….welllllll…….errrrrrrrrr……..those pina coladas in coconuts are really heavy! Kristina: Cleaning up after Glen’s cooking (he is a great cook - yum yum, but always makes a mess of the kitchen) will keep me moving! Also, we are not going away for Christmas break, so will be coming for classes!